Join Jason Hartman as he interviews Paul Wheaton, founder of Richsoil.com and Permies.com, on the benefits of permaculture, which is a different way of gardening without irrigation. Listen at: www.HolisticSurvival.com for more details. Paul’s definition of permaculture is creating a more symbiotic relationship between himself and nature so that he can be lazier. Permaculture includes how you build your building, the energy used, social interaction, as well as the horticultural aspects. Some of the benefits of this type of gardening are no irrigation, no bugs, and no weeding. The garden grows with little to no help from humans. Paul explains how observing foods that grow wild, such as raspberries and strawberries, provides the keys to more healthy, flavorful foods. Paul goes into how it provides a sustainable way of living based on the way things grow in nature, how cast iron pans can last hundreds of years, and the nutrition of food growing amongst trees, shrubs, and what we would normally call weeds. Jason and Paul also touch on the subject of corporatocracy of chemical-based solutions and government laws and regulations that make it more difficult all the time for individuals to grow their own gardens and sell their excess food. Paul is the founder of Richsoil.com, Permies.com and a few other gems (JavaRanch.com). Richsoil.com evolved out of a barrage of emails about lawn care and ultimately gave birth to Permies.com. Permies is a place where Permaculture enthusiasts come to learn, share, and learn some more from each other and is now the largest gathering of permaculturites on the web. As a certified master gardener and a certified permaculture designer, Paul Wheaton has written numerous articles (richsoil.com) and founded the permaculture forums (permies.com), which have since become the largest permaculture web site on the internet. 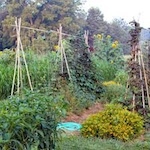 Paul Wheaton has been practicing and preaching this new way of gardening, farming and living for the last nine years, because, as he says, “It’s the sort of eco system that nature intended. Paul has many audio and video podcasts, and several community forums from which much information can be gathered, such as: Organic Lawn Care for the Cheap and Lazy, CFL Fluorescent Light Bulbs: More Hype Than Value and Raised Garden Beds, Hugelkulture instead of irrigation, and Rocket Stove Mass Heaters.